ВЛАДИМИР ПУТИН ПОТПИСАО ДЕКРЕТ О "УБРЗАНОМ РЕШАВАЊА ЗАХТЕВА ЗА РУСКО ДРЖАВЉАНСТВО УКРАЈИНАЦА КОЈИ ЖИВЕ У ДОЊЕЦКУ И ЛУГАНСКУ"
ВЕЛИКЕ ИНТЕРНЕТ ПРЕВАРЕ - ФАБРИКОВАЊЕ "КЛИКОВА"
МИХАИЛО МЕДЕНИЦА: ЗНАТЕ ЛИ ГДЕ СУ ДРЕНИЦА, ДЕВИЧ И НАJТОПЛИЈИ ЗАГРЉАЈ МАЈКЕ У ЦРНИНИ?! BELGRADE — Depending whom you ask, Aleksandar Vučić is either Serbia’s last great hope to become a modern European democracy or a strongman-in-waiting whose autocratic tendencies threaten to destabilize the Balkans. A one-time ultranationalist who played chess with the Bosnian Serb General Ratko Mladić and served as information minister under the nineties wartime leader Slobodan Milošević, the Serbian prime minister presents himself these days as a reformer committed to leading his country into the EU. Europe, tired of the turmoil that rocked the region for the better part of two decades, wants to believe him and has put Belgrade’s membership application on the top of the accession pile. Vučić is expected to emerge the clear victor in parliamentary elections later this month. The latest polls suggest his Serbian Progressive Party and its allies may even win an outright majority. The big question — for both the Balkans and Europe — is what he plans to do with that power. His detractors warn that he is building an Orbán-like political machine at both the national and local level, quelling dissent by maintaining a tight grip on the country’s media. “What’s his game? I don’t know, but it’s not good for democracy in Serbia,” said Jelena Milić, director of the Belgrade-based Center for Euro-Atlantic Studies, a liberal think tank. Love him or hate him, it’s difficult to deny that the 46-year-old Vučić has become the region’s key political actor. By keeping a lid on regional tensions from Kosovo to Bosnia, Vučić has managed to win the confidence of key leaders in the U.S. and Europe. Sitting in his Belgrade office last week, Vučić, dressed casually in jeans and a sport coat over an open gingham shirt, returned the compliment. “I consider her to be the true leader of Europe and I’m not ashamed to say that,” he said matter-of-factly. 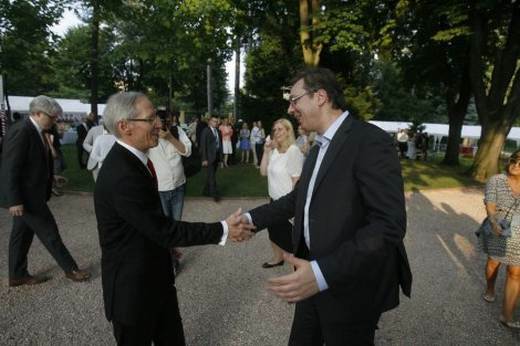 During the lengthy discussion, Vučić, an imposing figure of about two meters, appeared both confident and relaxed. Time and again, he insisted that his only agenda was to firmly anchor Serbia in Europe. “My political philosophy is to bring the economy to the top of our priorities, which means to have political stability to do all necessary reforms,” he said. Nearly 20 years after NATO bombs rained on Belgrade, the country’s economy remains weak. Economic output per head was just above $5,000 in 2015, putting Serbia, a country of just over 7 million, alongside the likes of Iraq and Libya. Amid the Balkan wars and persistent domestic tensions, Serbia’s economy never completed the transition from the communism of the Yugoslav period to a market economy. Unemployment is about 20 percent and the state sector remains the dominant employer in the country. Though the government is in the process of privatizing state-owned companies, many are too inefficient to attract buyers. Nonetheless, Serbia has made progress in restructuring its economy to bring its debt under control in recent years, winning high marks from the International Monetary Fund and others. Economic growth, at 0.8 percent last year, is modest but has beat expectations. If all goes according to plan, the economy should grow by more than 2 percent this year, Vučić predicts, above the IMF’s forecast of 1.75 percent. More important, the changing environment is attracting sorely needed foreign investment, from Ikea to Hilton to Chinese infrastructure companies. Just last week, China made an offer to acquire a state-owned steel plant, a crucial deal that could secure thousands of jobs in the beleaguered sector. Given that trajectory, it might be difficult to understand why critics both in Serbia and in neighboring countries distrust Vučić’s motives. The answer lies in his past as an extremist. In his early twenties, Vučić joined the Serbian Radical Party, an ultranationalist group to the right of Milošević that wanted to carve a “Greater Serbia” out of the ruins of Yugoslavia. He became a protégé of Vojislav Šešelj, the party’s leader who just last month was acquitted of war crimes in The Hague. As minister of information in 1998, Vučić cracked down on critical journalists, imposed hefty fines on publishers that didn’t fall into line and even banned some foreign media, moves he now says he regrets. Vučić broke with Šešelj in 2008, joining a group of other pro-EU Radical Party officials, including current president Tomsislav Nikolić, to form the Progressive Party. In the years that followed, Vučić, who famously declared in parliament in 2007 that his home would always be a “safe house” for suspected war criminal Mladić, gradually became more conciliatory. While he never fully renounced his nationalist ideology, he condemned the Srebrenica massacre and acknowledged Serbia’s shared responsibility for the Balkan wars. He visited Srebrenica for commemorations twice last year, returning for a second visit in November after being forced to flee by a rock-throwing mob during his first trip. Today, he credits that metamorphosis for his political success. There’s no question Vučić’s conservative pro-EU message has resonated amongst Serbs. For more than a decade after Milošević was overthrown in 2000, Serbia was controlled by reform-minded democratic parties. Many Serbs saw the democrats as the country’s salvation after the wars and isolation of the Milošević era. It was a tumultuous period, marked by the assassination of Prime Minister Zoran Đinđić in 2003 and other crises. Many Serbs were also left disillusioned by widespread government corruption. In 2012 parliamentary elections, Vučić’s Progressives captured 24 percent of the vote, finishing first. A few weeks later, Progressive party founder Nikolić was elected Serbian president, further bolstering the party’s position. After another round of parliamentary elections in 2014, the Progressives doubled their support to nearly 50 percent, giving them a majority of the seats in parliament and making Vučić prime minister. Despite his dominant position, Vučić called elections two years ahead of schedule in January, seeking a fresh four-year mandate. Months earlier, he hired another political renegade — former British Prime Minister and Labour leader Tony Blair — to advise him. Vučić’s aim is to secure another full term before he implements the deep job cuts and fiscal measures necessary to retool Serbia’s economy. His hope is that Serbia will be poised to join the EU by the time the government’s next term ends in 2020. That may be wishful thinking. The Commission has made it clear it’s in no rush to admit new members, but the EU’s general disarray and political infighting may ultimately prove to be the bigger obstacle. The risk is that keeping Belgrade on hold will push it deeper into the arms of Russia. Russian investment in Serbia is modest compared to that from the EU. Still, polls show Serbs consistently regard Moscow as Serbia’s most important ally. Russian President Vladimir Putin visited Serbia in 2014 to celebrate Belgrade’s liberation from the Nazis in 1944 by the Red Army. The commemoration, which included the country’s largest military parade in decades, was even pushed forward a few days to accommodate Putin’s schedule. While Serbs generally have a positive view of the EU, their connection to Slavic, Orthodox Russia has a more visceral, almost mystical quality. That tendency appears particularly strong among younger people. Though most young Serbs believe both living and democratic standards are higher in the EU than in Russia, a clear majority would welcome a Russian military presence in the country and would support Moscow’s foreign policy, according to a recent Ipsos study of 18-35 year-olds. Milić, of the Center for Euro-Atlantic Studies, says Vučić does nothing to counter Moscow’s influence. Serbia did not join the EU and U.S. in imposing sanctions against Moscow for its annexation of Crimea. Milić says Russia’s soft power, which she calls the “invisible hand” in Serbian politics, is growing. Šešelj and other far-right groups advocate closer ties with Russia. Their message is transported across Serbian social media by dozens of supposedly grass-roots pro-Moscow organizations that have sprouted in recent years. Milić says her own institute, which favors a pro-NATO course, has had its servers taken down by hackers. She was recently given police protection after receiving threats. “People are sentimental about Russia but are pragmatic,” explains Bojan Klačar, an analyst with the Center for Free Elections and Democracy, a non-partisan group that monitors and analyzes the country’s political scene. 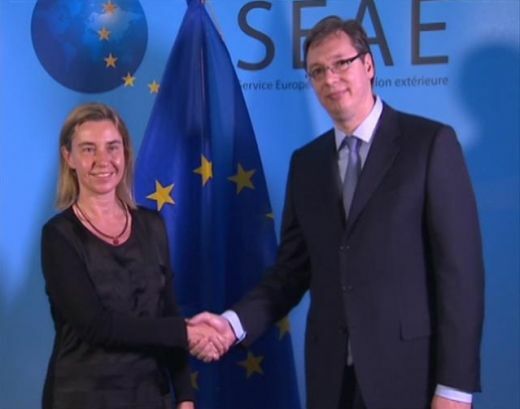 Vučić said he saw no reason why Serbia’s close ties to Moscow should be an obstacle on its way to the EU. “Yes, we would like to preserve traditionally good relations with Russia …but our priority, speaking about foreign policy, is to be on the EU path,” he said. 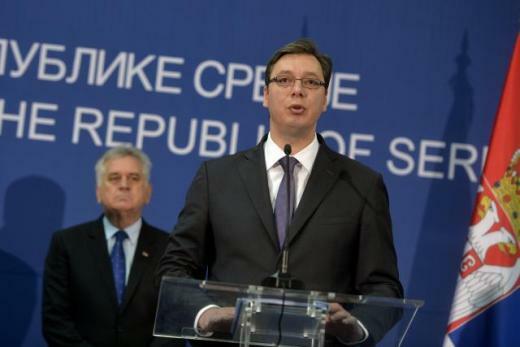 If nothing else, Vučić and his party have brought Serbia a semblance of stability. 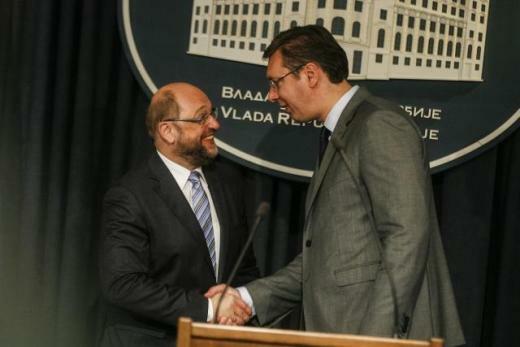 Though the liberal parties that preceded the Progressives laid the groundwork for Serbia’s EU aspirations, it was Vučić who formally set the ball rolling by beginning the accession process in 2014. Nonetheless, his detractors say the stability has come at the cost of democratic values, in particular a free press. In recent years, the Vienna-based Organization for Security and Cooperation in Europe has repeatedly complained about physical assaults against critical journalists, as well as hacker attacks directed at a number of media websites. “Media outlets and journalists continued to face pressure from politicians and owners over content and editorial policies,” democracy watchdog Freedom House concluded last year. This week, a reporter from Serbia’s public broadcaster in the Vojvodina region was suspended and had her salary cut for asking about Vučić’s ultranationalist past. Vučić tweeted “all of those who punish journalists, supposedly in my name, should be ashamed of themselves.” But Serbian reporters say such reprisals are far from rare. In Brussels, officials downplay such concerns. Given the continued tumult in the region, Serbia looks to be a relative sea of calm. While acknowledging Vučić’s shortcomings, in particular his sensitivity to criticism, EU officials say they see no viable alternative. By appealing to both nationalists and reform-minded pro-EU voters, Vučić is in a unique position to move the country forward, they argue. So far, he has given them little reason to doubt his sincerity. Not only has he stayed true to Serbia’s reform course, he has also helped keep the peace in the Balkans. On Kosovo, he proved to be more willing to compromise than the liberals in power before him. During the refugee crisis in the Balkans last year, Serbia was a model of cooperation. After Hungary closed its border, Belgrade shuttled refugees to the Croatian frontier, ensuring the refugees safe passage. In the interview, Vučić said his biggest worry was the rise of extremism in the region, especially in and around Bosnia. The recent Hague verdicts have reopened old wounds on all sides. “Who knows what spark might ignite Bosnia,” he said. In Serbia, Šešelj’s acquittal has made it all but certain that his Radical Party, which was shut out in the last elections, will win seats in parliament. On the campaign trail in recent days, Vučić has warned that the nationalists could even regain power. Given his huge lead in the polls, the comments appear to be a spirited attempt to get out the vote. Some analysts say the return of the ultranationalists could end up helping Vučić by making his party appear more measured. The risk is that after regaining a platform in parliament, the extremists will return the national debate to a narrative of Serbian victimhood. 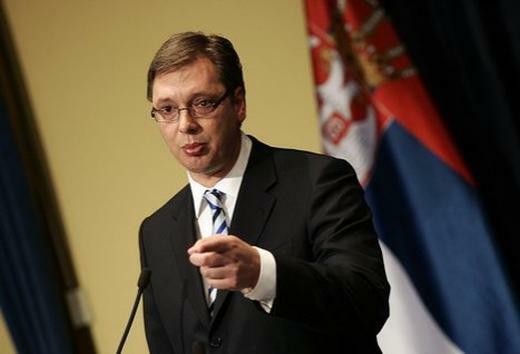 Vučić said he’s determined to keep that from happening. Timothy Less:	Dysfunction in the Balkans - Can the Post-Yugoslav Settlement Survive? Bogdana Koljevic:	Radical European Politics or New Colonialism?